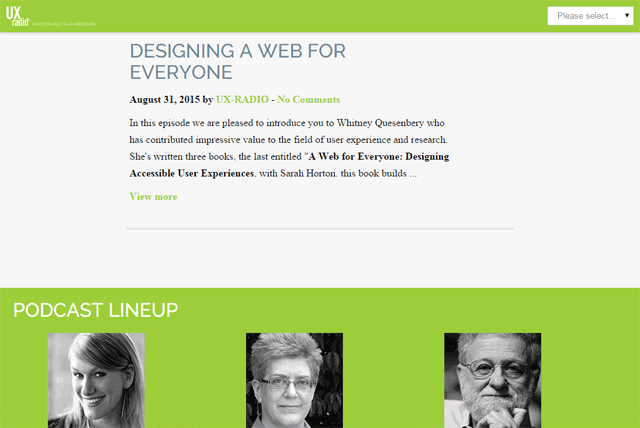 This podcast is hosted by usability and UI design expert, Jared Spool. This podcast offers up a ton of value because you will hear many industry leaders — the same folks who frequent the conference circuits — share insights on usability, UX design, and UI design. My favorite episode: Kim Goodwin – Using Scenarios to solve problems. In this episode, Kim and Jared talk about how user scenarios are great for expressing design problems and desired solutions by putting the user and his/her requirements in the proper context. 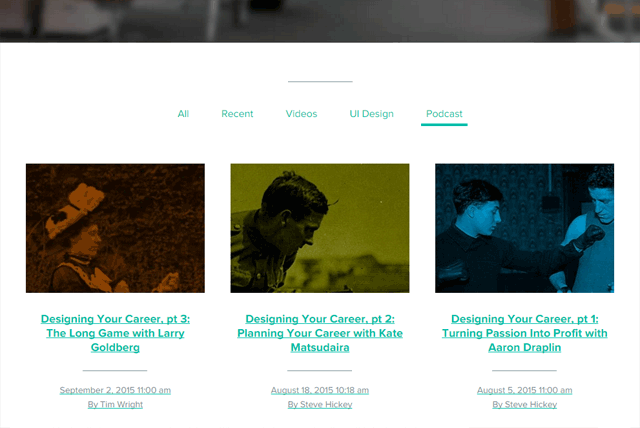 The Dirt Show is a podcast hosted by the team behind the UX design agency, Fresh Tilled Soil. One cool thing about this podcast is some topics follow a mini-series format, with multiple episodes and different guests talking about the same topic. For example, they have a mini-series on topics such as “designing your career” and “designing the future”. My favorite episode: Designing for Space Exploration with Jesse Kriss of NASA’s JPL. To date, this is in my opinion the best episode of The Dirt Show. This particular episode talks about how NASA uses hologram and virtual reality technology to create 3D worlds that mimic data captured by Curiosity, one of the Mars exploration rovers. For science! You can really feel the enthusiasm in the hosts’ voices because the topic is so cool. 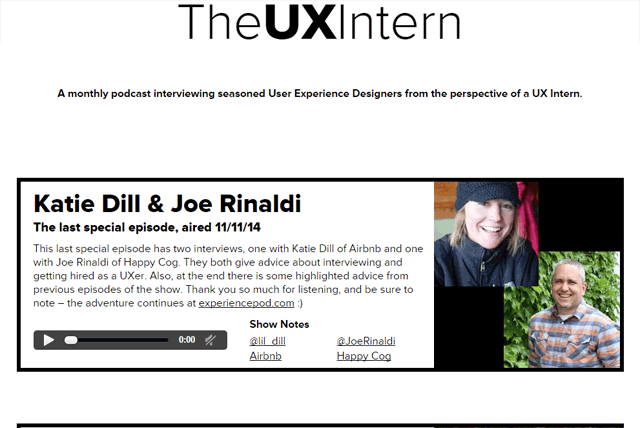 You should listen to The UX Intern podcast for a couple of reasons: There are only 12 episodes, so it will be easy for you to catch up and complete the whole series, and the episodes feature an all-star cast of best-selling authors and speakers in the UX industry. The likes of Steve Krug, of Don’t Make Me Think fame, and thought leaders whose work you will eventually come across if you are a UX professional, such as Aaron Walter from MailChimp, have made appearances on The UX Intern. My favorite episode: I can’t pick one particular episode because I think each one is a gem in its own right. I recommend going ahead and giving them all a listen. This podcast broadcasts every other week and has some really high-quality content. The hosts regularly appear at UX design conferences, interviewing speakers right from the stage for UX Podcast episodes. They also do what they call “link-shows” where they take a few key articles that are trending and discuss the implications of the ideas presented in the articles. My favorite episode: Imposter syndrome with Amy Silvers & Lori Cavallucci. While this podcast is mostly about UX, my favorite episode is a deep conversation about imposter syndrome. I believe that this episode helps a lot of working professionals who don’t know that what they are feeling and going through is common. 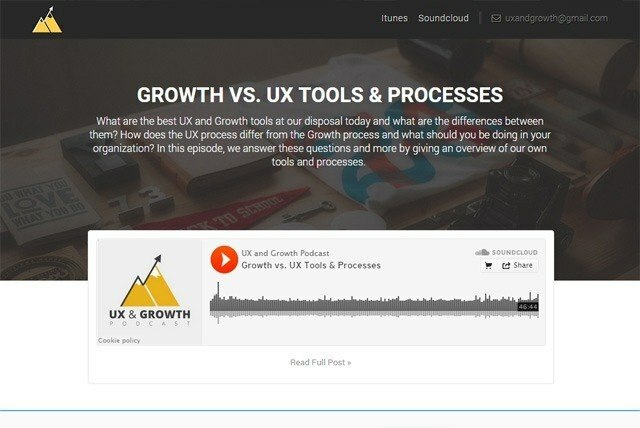 The recently-launched UX & Growth podcast focuses on how startups can leverage UX to help grow their company. This podcast contains a ton of high-quality content and good discussions around topics surrounding UX design. It’s interesting to learn about UX from a perspective that’s not focused on design, but rather on business objectives. 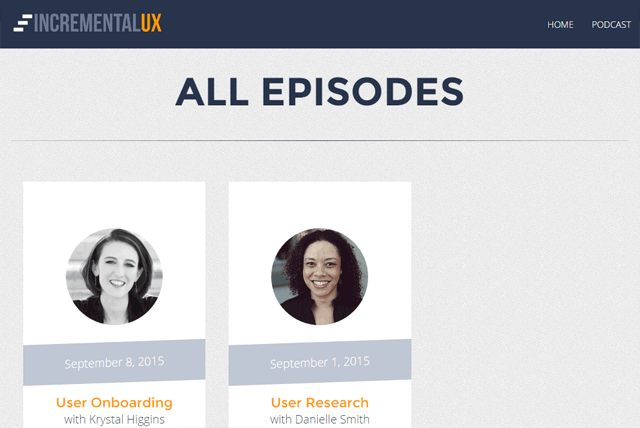 My favorite episode: Human to Human UX. This episode covers how companies can use the human connection to enhance how people feel about brands. They mention some good examples of companies that do this well. 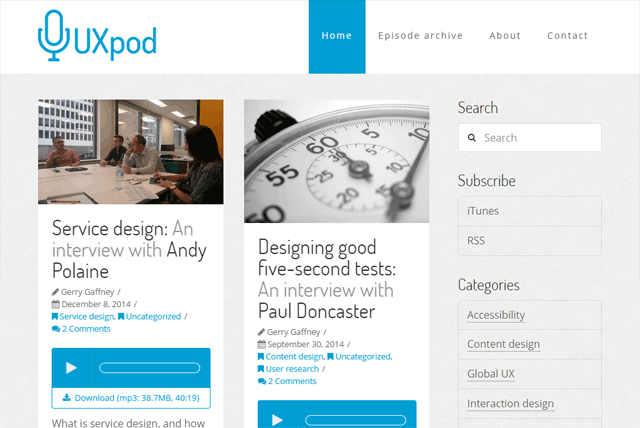 Although UX Pod hasn’t released a new podcast episode since late-2014, it’s still a treasure trove of information. 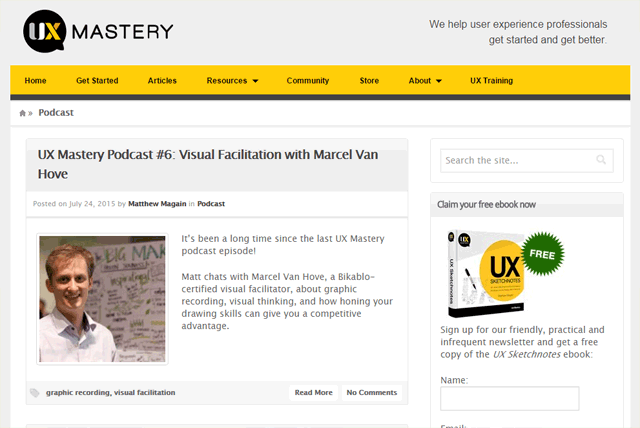 If you are new to UX, this podcast is a great place to start. My favorite episode: Designing good five-second tests. In this episode, the discussion revolves around five-second tests for rapid design feedback. They discuss how and when to use this type of test, and share examples of when it’s effective and when it’s counterproductive. 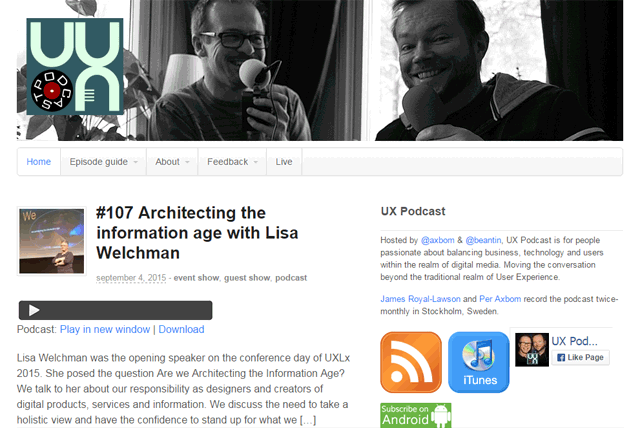 UX Radio is a podcast about information architecture (IA), UX, and design. My favorite episode: Curating UX Expertise with Louis Rosenfeld. UX Mastery is a website that hosts a lot of useful articles and content related to user experience design. The site also has an infrequently updated podcast. 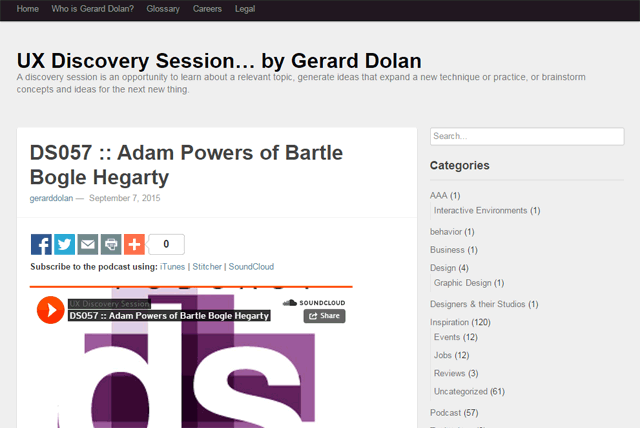 At this point, you may have realized how passionate I am about UX and podcasts. I’ve realized that you can, in fact, learn a lot about the subject just by listening to podcasts while on the go (for example, during your daily commute to work). That had me wondering how awesome it would be if I started my own podcast and got a chance to interview industry leaders in the field of UX. By seeking out experts and teasing out UX design techniques from some of the best minds in the industry, I hope to help people incorporate user experience design into their workflows. So I started the IncrementalUX podcast. Feel free to give my podcast a try and give me your feedback. For a taste of IncrementalUX content, check out this episode: User Research with Danielle Smith. Dr. Smith is an exceptionally talented person, and we talk about several techniques for user research and testing in the episode. 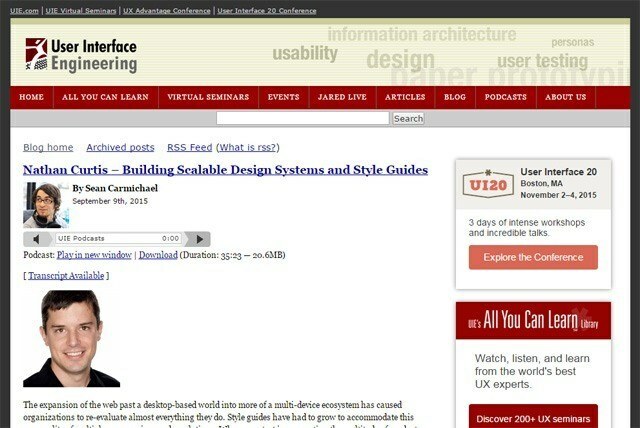 What’s Your Favorite UX Podcast? This is obviously not an exhaustive list of UX podcasts. I’m curious to find out what your favorite UX podcasts are, and I look forward to checking them out. Vinay Raghu is a UX consultant based in New Haven, Connecticut. He’s the founder and host of the IncrementalUX podcast. Previously, he was a senior UX engineer at Enqos and Runway2Street. Connect with Vinay via his website viii.in, Twitter, and GitHub.